Mindy Kim is playing the Futures Tour this season, but based on her play there she'll be a fully exempt member of the LPGA in 2009. That's because, with four tournaments remaining on the Futures Tour schedule, Mindy is second on the money list, nearly $30,000 ahead of the third-place golfer. She's guaranteed to finish in the Top 5 on the money list, thus earning her LPGA Tour card for next year. Mindy, who turned 19 a month ago, is a native of Seoul now living in California. She turned pro in 2007, making 10 of 12 cuts on the Futures Tour. 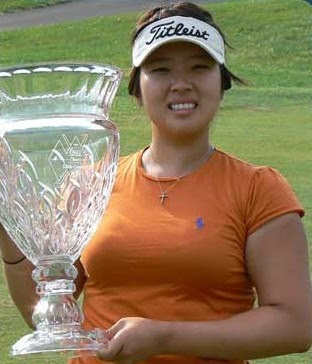 This year has been a breakout season for Mindy, who has three Futures Tour victories - including at the Falls Auto Group Classic, completed Aug. 10 (she's holding the trophy above). She has nine Top 10 finishes in 14 starts, ranks second on the money list and second in scoring average. Q: You must have really missed your parents when you won your first tournament as a pro this year in Kansas. Kim: Yeah, I called my sister and she asked me if I made a lot of money. I said, "Not a lot, but I can get you a puppy." Inquiring minds want to know: Mindy, have you ponied up a puppy for your sister yet?